In 2011 Rocksteady Studios raffled away four limited edition Xbox 360 Consoles. One was in a raffle directly from the studio and three were raffled at the PAX Expo. 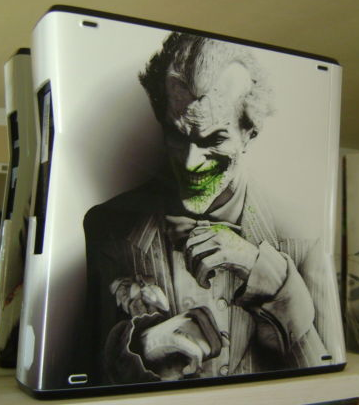 Each console was custom colored by ColorWare. 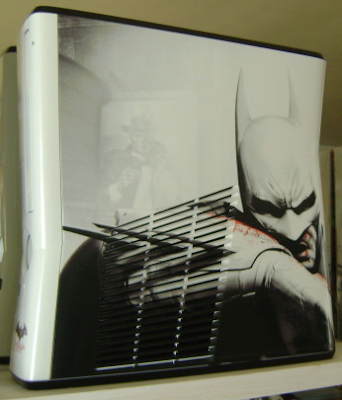 One side features a black and white Joker with a hint of green (Side 1 Above) and the other side depicts black and white Batman with a hint of red. I've never seen one of these sell before, but a seller is asking almost $1,500 for one of the four on eBay right now. Considering there are only four ever made it might be pretty close to the actual price. The chart above shows the lifecycle for a video game's price as it gets older. A game will generally drop in price pretty quickly the first few year. Then the price decline slows down until it eventually reaches stability. After a long enough time, prices for the game start to increase again as it becomes harder to find and more of a collector's item. The first five years after a game launches the resale price declines very rapidly. There are short reprieves from the decline every November and December when there is a brief holiday bump in prices, but the decline begins again in January. During the first two years, prices will decline roughly 40% per year. In years three through five, prices continue to drop double digit percentages each year but it starts slowing down. In this period prices generally decline but the pace slows considerably. During this entire five year period prices will drop 40-50%, which is a much slower pace then a similar drop in one year in the 'Early Years' stage. After five years most games are no longer readily available at retail and are only available via resale. This helps give prices more stability because supply is no longer increasing. But demand has usually dried up quite a bit as well as consumers focus on the more recent releases. During this period the seasonal price swings during the holidays are much more noticeable. Prices will increase 30-50% during the holidays as consumers are forced to buy resale versions if the item is on a Christmas list. Prices are quite stable for games in this period of their lifecycle. Another console generation, or two, has come after the game was released and no retail stores carry the games or consoles anymore. Even used game shops like Gamestop have stopped selling these titles. The only place for consumers to find the titles are usually resale from other consumers online or other consumer-to-consumer places offline like garage sales or flea markets. The prices will show a very consistent seasonal pattern with price declines during the year and increases during November and December, which bring the prices back to the same level they were a year ago. During this time period, a few games continue to lose value but most are very stable or start to increase in price. The price increases will generally be fairly small to begin with. Some collectors start coming into the market and a nostalgia factor comes into the price. People who grew up playing the games as kids are now 20-30 years old and many of them want to play games they remember playing as kids. Almost all games are either steady in price or increasing during this time period and some games start increasing very substantially. More collectors enter the market and are willing to pay top dollar for the most collectible games. These games are the ones with the biggest increase in price. Complete games with the box and instruction manual sell for a big premium to the game only versions because they are quite a bit harder to find. After 25 years many games have been destroyed. Brand new games sell for many times more than the game itself because collectors are willing to pay a bunch of money for them and they are harder to find in sealed condition. The above chart shows the lifecycle chart with the release dates for each console shown for reference. Super Nintendo and Sega Genesis games might be the next ones to start increasing in price according to the past data. If the Genesis Price Index is any indication, prices actually started increasing dramatically about 3-4 months ago. Obviously these trends and charts do not hold true for every game. There are some exceptions that increase in price after release or some games that drop in price much faster than average. For the average game this lifecycle is very close to how its price will behave over time if the past is any indication of the future. We do not have price data going back 34+ years, but we do have four to five years worth of data for thousands of games at different stages in their lifecycle. We combined the price data for all the different games to determine the lifecycle during the entire 34 year time period. The four years of Xbox 360, Wii, and PS3 data was combined with the four years of PS2, Gamecube, and Xbox prices at their respective years from release on the chart. The prices were indexed so prices differences at the start of one generation and end of another didn't cause a spike in the chart. This was repeated for each subsequent generation. Any gaps with no price overlap or no price data at all we used trends for the previous generation to extrapolate the few months with missing data. The only long period of time with no data was between Atari 2600 and Nintendo NES, which was a little less than six years. All other time periods with missing data were less than a year or two. 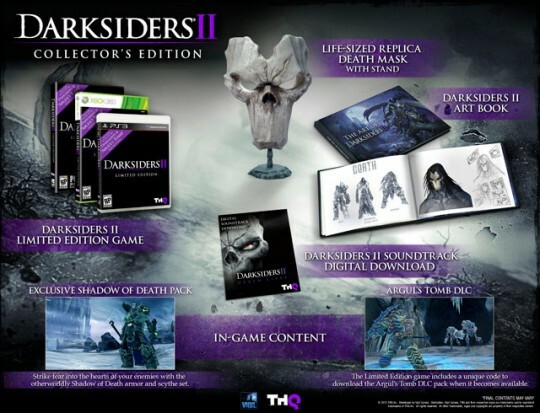 THQ announced two special editions for their summer release of Darksiders II for PS3 and 360. There will be a limited edition and a collector's edition. All pre-orders will be limited editions. The collector's edition has a list price of $99 and is only available at Gamestop. Our Pricing Cart feature for free and premium subscribers is one of the most popular features on our site. It allows collectors and retailers to value multiple game lots at the same time. We made some additions to the Pricing Cart that make it even more powerful and make it into a simple point-of-sale (POS) system for small retailers. Now the Pricing Cart lets you search by UPC code. Anyone with a barcode scanner can quickly add items to their cart. This makes it much easier for retailers to scan games a customer brings into a store. In 2-3 seconds you can scan a whole pile of games and have a total price for the entire package. To help retailers calculate sales tax during a transaction we implemented an optional sales tax setting. Set the "Sales Tax Rate" to anything but zero and the cart will show the sales tax and a grand total with the items and sales tax. Some of our current customers asked for this feature. You can customize the markup you want to use for your store in a percentage markup and/or a flat dollar amount. The cart will remember your settings for future use as well. An quick example: Our prices are for the item without a cost of shipping, you can add $3.99 to all your prices if you want your prices to match what a customer would pay if they had to pay shipping online. 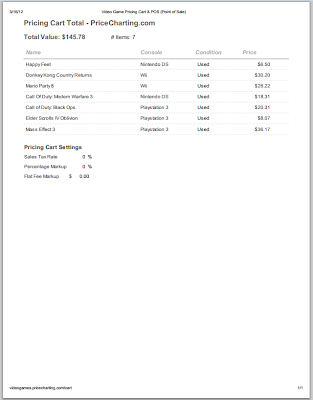 We improved the formatting when you print the Pricing Cart screen. The page no longer includes logos, menus, and other extras when printed. 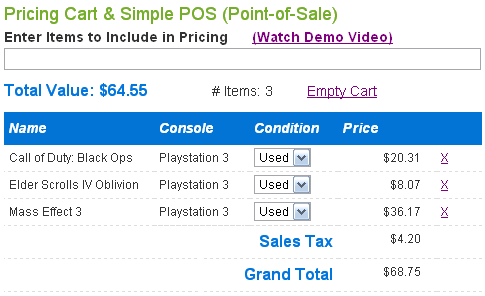 It just includes a list of the items in the cart and the total value. 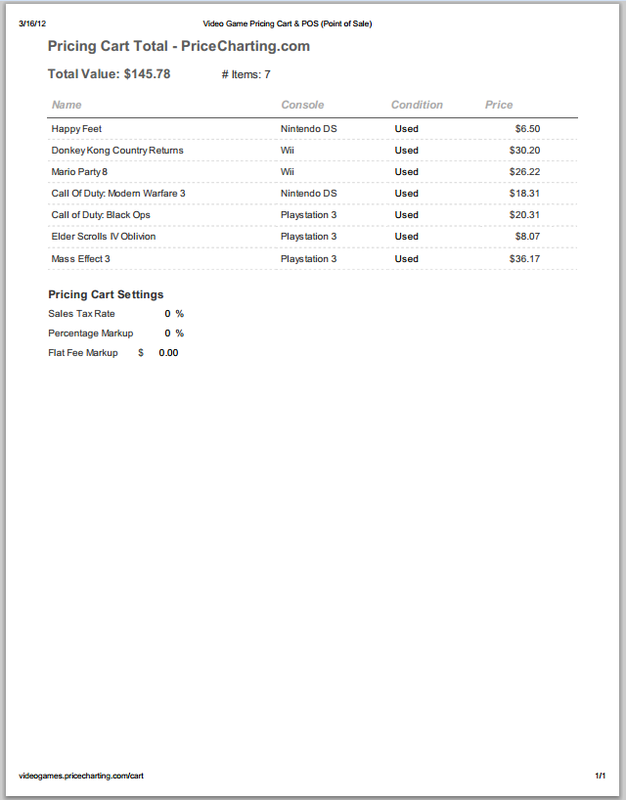 Retailers can print this page for a simple receipt for customers and consumers can print a list of games for their records too. If you have any suggestions or comments about these features or the Pricing Cart in general please let us know in the comments below. Below are some quick tips on how to clean your video games and game systems using household products. The most common problems like dirty contacts, stickers, and markers are covered. Most of this info pertains to older cartridge based consoles but will work on newer consoles in some instances. Warning: While cleaning the inside of a game system with a liquid solution, ALWAYS UNPLUG THE CONSOLE first to avoid electrical hazards. Also make sure the electronics are completely dry before powering the system back on. For cartridge based consoles it is highly recommended to clean your games and the system (Mainly the cartridge slot) before playing games on it. I say this because some games or cartridge slots may be really dirty and the last thing you want to do is insert a dirty game into a clean cartridge slot or the other way around. It is very common for people to simply blow on cartridge based games to clean them. This is a simple solution but not a perfect fix. I would recommend using a Q-Tip and original Windex, yes Windex not rubbing alcohol. Believe me it works much better to clean games. I usually have a small jar I put Windex in and dunk the Q-Tip in to soak the end with Windex. You will want to then place the wet end of the Q-Tip on the contacts of the game cartridge and run it across the board a few times on both sides of the board. You may see the tip of the Q-Tip turning black from the dust it has collected, even if you did the old blowing into the cartridge technique you will be surprised how much more dust and grime is still left on the board. When done using the wet side of the Q-Tip you will now want to use the dry side of it to dry the area you just cleaned. Cleaning cartridge slots in the game system is a little different. Usually I like to take a credit card and wrap it in a thin felt cloth and spray it with Windex. Do not completely soak the cloth just dampen it. Simply take your dampened cloth with card and slide it into the cartridge slot moving the card up and down through the slot. To dry it you can simply blow on it or you can use a can of compressed air. Windex is designed to dry quickly without having to wipe it off. So not much to worry about if you just dampen the cloth it should dry without a problem. Removing those pesky stickers can be a little annoying and involves a little patience. It is recommended to slowly peel the sticker off, but we all know chances are the sticker will just tear and you will be stuck with a white torn sticker left on your game or sticker residue. Only if you’re lucky will the sticker simply come off with no problem. The longer a sticker is on the product the harder it is to remove. If the simple tear method doesn't remove the entire sticker try this. Use either high content rubbing alcohol (Usually 90% or higher) or Goo Gone. Whichever you may have at hand. Take your product and apply a generous amount to a paper towel and soak the sticker. You may also slowly pour the chemical directly from the bottle onto the sticker but be careful for spills. Let the product sit for approximately 30-60 seconds, rubbing alcohol dries very quickly compared to Goo Gone so keep that in mind. After the chemical is applied you may just want to scratch away at the sticker with your fingernail until the sticker is removed. Sometimes you may need to apply more chemical and repeat these steps until the sticker is removed completely. You can also use a razor blade and scrape the sticker off instead of scratching with your fingernail, but the razor may cut the product you are cleaning if not positioned right, so be careful and patient if you try that. For any leftover sticker residue after the sticker has been removed I recommend using a rubbing alcohol soaked paper towel or even hot water soaked paper towel and wiping the area clean. Then simply dry it off with a paper towel. Now you should be sticker free! These tips are for stickers stuck on game cases, game cartridges, or consoles. If you have a sticker on a paper game cover art or manual I cannot recommend using these techniques as they will damage your product. Also this only works on paper based stickers. Some stickers may be metal based "Non-removable" rental stickers. There are ways to remove rental stickers but that is a completely different method and may damage your product. So you just got a game or system with someone's name or initials. What do you do? Well truth be told permanent marker really isn't permanent and can be removed using two easy techniques. Technique 1 involves hairspray. I prefer hairspray in an aerosol can as it seems to work better. Simply spray the area with hairspray and let it sit 5-10 seconds. You should see the ink start to bleed off quickly. Now wipe the area vigorously with a dry paper towel. Most if not all the ink should be gone. If some ink remains simply repeat the above steps. A few things I want to address about hairspray are that it does not leave a sticky feeling at all to the applied surface. Hairspray is designed to be absorbed in the hair and then cure after being absorbed. Hairspray cannot be absorbed in plastics and metals. If stickiness is of a concern to you it is possible to wipe the area clean with a paper towel soaked in water and wipe dry afterwards. This method works great for areas like LCD screens or any area where light pressure is needed to remove ink from a product. Since the hairspray does most of the work for you. Technique 2 involves using a Mr. Clean Magic Eraser soaked in water. Simply soak the magic eraser in water and start scrubbing away at the permanent marker ink. With a little patience and elbow grease the marker will come right off. Corrosion can appear as a light blue or white gunked up substance on game cartridge boards or system cartridge slots and electrical connectors. Corrosion and rust are completely different types of degrading on metals. Corrosion is usually formed by two dissimilar metals. There are several other ways it can be formed, but you're not here for a chemistry lesson you want to learn how to clean the corrosion off. To clean corrosion off you simply need baking soda and hot water from your faucet, that’s it. I would suggest one cup of hot water then about 2 tablespoons of baking soda. Mix the two together with a spoon. Now you have a safe corrosion cleaning chemical. Depending on what you are using it on makes a difference how you apply it. If it is a cartridge slot on a game system than you may want to just apply it to a felt cloth and wrap the cloth around a credit card (Make sure the cloth is damp you and not soaked. You may need to lightly squeeze the cloth to release some liquid), then proceed to move the card up and down in the slot to clean the area. For game cartridge contacts you can simply dunk a Q-Tip in the solution and use it in a similar way you would to clean games with Windex. I would allow the solution to sit for a few minutes before you dry the area. When done dry the area with compressed air or a dry Q-Tip. You can also use a Scotch Brite pad dampened in this solution to clean electronics if you can access areas with it. Corrosion rarely forms on electronics, so only use this guide if corrosion is present. If a disc you have has scratches or scuffing you may want to seek out a place in your area to correct these problems and resurface the discs. Most places only charge a few dollars to resurface discs. I would not recommend using cheap cleaning kits to clean a disc as most people have reported that it may make your disc worse. I have experienced this first hand with Disc Doctor as the machine left many scuffs on my disc. For discs some problems may be from simple finger smudges present on the surface. For a light cleaning of the disc use a dry felt cloth and rub the surface of the disc from the inner ring outward. Do not rub the disc in a circular motion as it will go against the 'grain' of the disc. No chemicals needed here. So you have a game system and its collecting dust and you want to let it shine like new again. Or maybe you have a console or controller that has buttons that may stick and may not rebound all the way back or get stuck. Cleaning consoles goes a long way for looks but also in the consoles functionality. If you want to properly clean the entire shell of the system you can simply remove the screws and the electronics connected to the case. I really would only do this with systems that have ridges in their molding such as an Atari 2600 or Sega Genesis systems. Cleaning those grooves can be a pain without taking the system apart. Don't be afraid to take the old school game systems apart they are literally just a couple of screws and the motherboards come out easily. You can take the bare casings of the system and wash them in a sink with soapy water and a sponge. Dry it off and put back together. This method also works to clean jammed buttons that are filled with grime and food crumbs that get stuck in the buttons from kids using the system/controller. A Swiffer duster and a can of compressed air are great products to invest in. No need to rip the console apart to use those. Keeping your consoles free of dust helps them breathe better keeping them less prone to getting clogged with dust, which can overheat the system. I've seen modern systems fail due to overheating from being covered knuckle deep in dust. I'm always interested hearing new technics and what methods you use to clean games and consoles. Feel free to leave a comment with your cleaning technics below. The article about the rarest and most expensive Nintendo DS games has been revised to include 15 games with updated prices and descriptions. Read the updated rare DS game article to see more. After seeing the high prices for limited editions of Kingdoms of Amalur: Reckoning and Dead Space, we have decided to write more articles letting our readers know when a noteworthy limited edition is announced. Hopefully you will be able to buy some of these before they start selling for thousands of dollars. The first limited edition as part of these new articles is Game of Thrones Limited Edition. 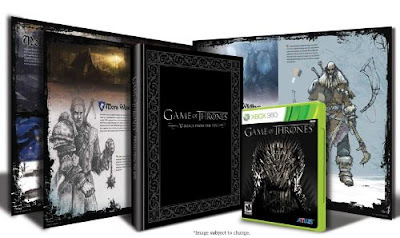 It is available for Xbox 360 and Playstation 3 at Amazon, Gamestop, and HBO Shop. The game is published by Atlus and an RPG. Both good indicators of a game that keeps its value over time. The game is based upon the HBO series, Game of Thrones, and the book A Song of Ice and Fire by George R. R. Martin.